409. She is not only the most senior witness called, but she is obviously a very senior person within the Post Office organisation. 413. 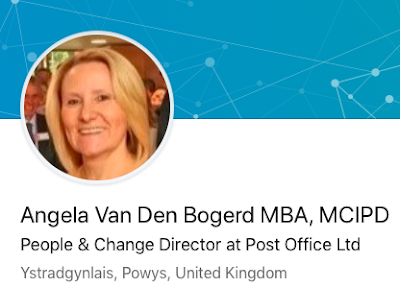 Mrs Van Den Bogerd has been closely involved in the Post Office response to the Second Sight Interim Report. 414. Indeed, some passages of the Response [to Second Sight] were, word for word, exactly the same as her witness statement. She did however attempt to distance herself from it where she could, by denying she was “the author” (it was never suggested she was) and denying that she had signed it (again, it was never suggested she had). 416. Notwithstanding the making of the GLO [this group litigation], Mrs Van Den Bogerd appears entrenched in her refusal to what I consider to be the obvious common themes connecting all these claims, and I simply cannot understand this. 417. There are two specific matters in which I find that she did not give me frank evidence, and sought to obfuscate matters, and mislead me. 418. ... she explained that her answer that she was coming to the matter [information about a lead claimant Naushad Abdull] cold was “a mistake”. I reject that explanation. Her Horizon witness statement is very detailed, and was signed just a few days earlier than her cross-examination. Mrs Van Den Bogerd is a very clever person, in my judgment, and she had detailed knowledge of the Lottery TCS/Mr Abdulla situation. She sought to give me the impression that she was being caught unprepared, and had only come to the matter cold when being asked questions in the witness box. This was wholly misleading. 419. The second matter concerned a very valid point that Mr Green [claimants' QC] put to Mrs Van Den Bogerd that she was very reluctant to give evidence that would be unhelpful to the Post Office’s case. 425. In a witness statement by her of 145 paragraphs, 44 of those are devoted to the Post Office as a business. None at all deal with the very great number of detailed points put to her by Mr Green, based on internal Post Office documents over the years, which demonstrate an internal view of unsatisfactory performance at odds with the Post Office position in the case.... Her judgment also seems to have been uniquely exercised to paint the Post Office in the most favourable light possible, regardless of the facts. 432. Mrs Van Den Bogerd was the first Post Office witness clearly to explain that even if a SPM [Subpostmaster] “settled centrally” a disputed item, it was treated by the Post Office as a debt, which would be subject to the debt recovery process, unless that process was positively suspended. 441. Mrs Van Den Bogerd would, on some occasions, give clear and cogent evidence... However, for the most part, she was extraordinarily conscious of the need to protect the Post Office’s position in the case generally, which given her very close involvement in the Horizon problems with SPMs over the years, effectively meant protecting her own position too, which led to a disregard for factual accuracy. I find that it is necessary to scrutinise everything she said as a witness, both in her witness statement and in cross-examination, and treat it with the very greatest of caution in all respects. 544. The Post Office has appeared determined to make this litigation, and therefore resolution of this intractable dispute, as difficult and expensive as it can. Mrs Van den Bogerd did not provide any reference in her witness statement to matters unfavourable to the Post Office case. That witness statement was her evidence in chief, and therefore supposed to be the whole story. I find that she did not do so, because those matters (which Mr Green put to her in some detail) were highly unfavourable to the Post Office’s case. She was simply not prepared to volunteer such matters in a witness statement. She was only grudgingly prepared to accept them in cross-examination, after some time. 546. Mrs Van den Bogerd is, in my judgment, a particularly stark example of how a witness had to force their evidence of fact to fit with a pre-ordained thesis. She remains, apparently genuinely, of the view that none of the different claims by the 589 Claimants have common issues or themes between them, and every single case is simply factually different, with no connection between them. This is despite the approval of a Group Litigation Order by the President of the Queen’s Bench Division. 548. Unless I state to the contrary, I would only accept the evidence of Mrs Van den Bogerd and Mr Beal in controversial areas of fact in issue in this Common Issue trial if these are clearly and uncontrovertibly corroborated by contemporaneous documents. Angela van den Bogerd is back in court on 18 March giving evidence in the Horizon trial. That will be interesting. If you want to read the full Common Issues trial judgment, click here. Or open it up in a different window and you can cross-refer if you come across anything in this post you want to explore in more detail. 541. ... a number of contemporaneous documents internal to the Post Office show that there has been, at least to some degree, an awareness of Horizon problems within the Post Office itself over a number of years. 543. These internal Post Office entries make it clear that, notwithstanding the tenor of the Post Office evidence before me, behind the scenes there were at least a number of people within the Post Office who realised that there were difficulties with the Horizon system. 545. The problem with the Post Office witnesses generally is they have become so entrenched over the years, that they appear absolutely convinced that there is simply nothing wrong with the Horizon system at all, and the explanation for all of the many problems experienced by the different Claimants is either the dishonesty or wholesale incompetence of the SPMs. This entrenchment is particularly telling in the Post Office witnesses who occupy the more senior posts. When even a Post Office auditor, Mr Longbottom, attempts to go beneath this veneer, properly to investigate an unexplained shortfall, and finds that he is not provided with the documents he considers necessary, very considerable doubts arise about the approach adopted at the Post Office to its overall control of information. 547... They give me the impression that they simply cannot allow themselves to consider the possibility that the Post Office may be wrong, as the consequences of doing so are too significant to contemplate. 366. Mr Beal is now the Head of Agents’ Development and Remuneration. 371. Mr Beal also gave evidence that is hard to reconcile with the actual documents themselves. 373. Mr Beal sought to give me the impression that the intention of the Post Office was to keep the liability for losses the same when the NTC [network transformation contract - a successor to the Subpostmaster contract] was introduced. I doubt very much that was the case, and I reject that evidence by him. 375. Mr Beal’s way of giving evidence was very much the house Post Office style, certainly for the more senior of its management personnel who gave evidence. This was to glide away from pertinent questions, or questions to which the witness realised a frank answer would not be helpful to the Post Office’s cause. ... He sought to give me evidence highly favourable to the Post Office, which I consider was slanted more towards public relations consumption rather than factual accuracy. 376. His evidence came across to me as a public relations exercise. 384. I found Mr Williams a clear and helpful witness... his evidence certainly does not contradict Mr Bates’ [lead claimant] account in general terms, it rather confirms it. 385. I prefer the direct evidence of Mr Bates to the more general “this is what should have happened” type of evidence from Mr Williams. 388. She sensibly accepted receiving a document such as the Subpostmasters' Contract on the day of branch transfer was “a bit late” as Mr Green put it to her, but regardless of that, in my judgment it was too late. Although it is helpful to have one’s judgment on a point confirmed by a Post Office witness. 390. I can think of no logical reason why the Post Office should have been so secretive to incoming Subpostmasters about the document which the Post Office considered would contain their contract terms. There would be every reason to provide it, rather than either withhold it. 392. Mrs Rimmer was a reasonable and straightforward witness. Where her evidence differed on specific issues of fact with any of the Lead Claimants, I prefer the evidence of the Lead Claimants, simply because her evidence was so general. 397. On the evidence that I have accepted from the Lead Claimants, [Mr Breeden's statement on receiving their contracts immediately prior to signing them] is not even remotely accurate or correct for at least some who contracted on the SPMC [Supostmaster contract], and those affected could be a large number. Mr Breeden is a senior person within the Post Office and must have known that this general statement was not wholly correct. This is an example, I consider, of PR-driven evidence. 400. Initially he said that that there was no material difference in the SPMC and NTC terms, the latter was just more explicit. That is simply not correct, and I do not accept that Mr Breeden could believe it was. 408. As with the other more senior members of the Post Office group of witnesses, Mr Breeden is articulate, intelligent and also acutely aware of how much the reputation of the Post Office hinges on these proceedings. His evidence was presented in terms obviously designed to put the best possible gloss for the Post Office on matters, and some of his statements simply did not stand scrutiny. 442. Mr Dance is the Retail Transformation Integration Manager.... At one point he said “to myself as an accountant” and I therefore assume he was so qualified, although it is not mentioned in his witness statement. 447. He knew nothing about such discussions at all. He had not had any such discussions himself and assumed that this had been done by [his colleague] at a steering committee. When a series of rather confusing answers were forthcoming, what it boiled down to was that the NFSP could, may or might know about the contents of such plans if applicants showed them any particular pro forma. There again, they may not. 451. Overall, I found Mr Dance’s approach to giving his evidence unhelpful. His written evidence glossed over important points ... and orally Ms Donnelly [one of the JFSA's barristers cross-examining Mr Dance] would often have to pursue a particular point in order to obtain a straight answer. I consider his evidence suffered from an overarching reluctance to provide accurate evidence, if that may assist the Claimants. 452. Mrs Dickinson is a Security Team Leader at the Post Office. 456. The escalation of fraudulent behaviour is described in the fraud prevention field as “the fraud triangle”. When she was being cross-examined about this, Mr Green referred to the Enron corporate fraud to suggest that both companies and individuals can engage in conduct that increasingly escalates in this way within the fraud triangle, and that phrase is also used to refer to companies as well as individuals. Mrs Dickinson claimed not to know about the Enron case. 458. Mrs Dickinson is a fraud specialist and it is simply inconceivable that she was not familiar with the Enron case, at least in outline terms. I reject her evidence that she did not know about Enron, which I find incapable of belief. The only reason to claim ignorance, as she did, was simply to be unhelpful, which is what I find she was being. 459. With respect to Mrs Dickinson, and in any event, in my judgment her evidence wholly misses the central point that is at issue in this litigation. I entirely accept that the Post Office requires its SPMs to be honest, and I do not believe that point to be in issue. If it is, it should not be. 461. It is not clear why having more detailed knowledge of Horizon, or even having worked on Horizon, would cause her a conflict in the way she explained. Logic would suggest that an investigator might be assisted by having more – or even some - detailed knowledge of how Horizon worked; at the very least, I would expect her to know the options available to a SPM if they were faced with (say) a TC that would affect their branch accounts with which they disagreed. In my judgment, an investigator such as Mrs Dickinson ought to have a detailed knowledge of how Horizon works, certainly in terms of the options available to a SPM at the end of a trading period, as otherwise she would not know if a SPM she was investigating was telling her the truth or not. Michael Shields (started with the Royal Mail in 1989) Mr Shields' job is Temporary Subpostmaster Advisor. "In such cases the retail network manager may require the subpostmaster to make his premises available at a mutually agreed rate of payment for the continued provision of Post Office services." Mr Shields was unaware of this too. He was aware of the Local NTC contract, however, and was more familiar with it than either of the SPMCs, although he would not look at it during his role to read or check the wording. He was not familiar with the term used in the NTC for a Temp, namely “temporary substitute”. 469. ... Mr Shields did not know of the differences between the SPMC, the Modified SPMC and the NTC in terms of the different contractual obligations upon suspended SPMs... This is at least consistent with the point accepted by Mr Breeden, namely that the Post Office doesn't tend to focus on the precise words of a contract, it knows what its interpretation is and that is what everyone works to. This could be described as the Post Office method of contractual construction. 472. ... either Mr Shields was not being straight with me, or the Post Office does not follow its own policy. I consider he was giving me accurate evidence, which means that this policy set out in the 2015 document must be being routinely ignored by the Post Office. 474. His lack of knowledge of the terms of the SPMC and the Modified SPMC was surprising... but did match the Post Office’s approach to contract wording generally. The Post Office personnel believe they know what a SPM’s obligations are and they do not need to trouble with the wording of the NTC or the SPMC, or the differences between them. 476. part of her written evidence sought to give the impression, through careful wording of her witness statement, that she had covered the same ground in the interview as contained in these much later checklists... This passage of her evidence appeared to have been written for her. 478. I do not accept that she told Mr Abdulla to take either legal or professional advice, as her written evidence suggests in paragraph 18 of her statement. That passage of her written statement is, I am afraid, just wishful thinking on her part, and on the part of the Post Office. I do not accept she told him that he was obliged to provide personal service. I find as a fact that he was not told to take legal or professional advice. 480. Mrs Ridge seemed to me to have a greater awareness of the need to be fully accurate and helpful to the court than some of the other Post Office witnesses. 498. Mr Webb seemed to have a fairly open mind about the way he gave evidence, without worrying in advance which direction the answers might take him, and I found him reliable. 502. [His] evidence is, purely and simply, an attempt to put matters as favourably for the Post Office regardless of the accuracy of the evidence. Mr Haworth had initially in his written evidence said he had used the same checklist as Mrs Ridge and Mr Trotter. This was not the case... It is a puzzle how someone can expressly say their checklist was the same as that of Mrs Ridge, if they have never seen Mrs Ridge’s checklist. It is also a puzzle how a witness statement can say a witness did a particular thing, produce a document in reference to that, but then the witness themselves say that they have not seen the document produced in support. 503. I did not find his evidence either helpful or accurate... Neither did he know how Horizon worked, or that a SPM would be forced to accept in their accounts figures with which they disagreed. 505. I reject Mr Haworth’s evidence that he would always explain to an applicant at interview that they should obtain legal advice... There is no doubt that the awareness on the part of the Post Office of the importance of recommending an incoming SPM take independent legal advice eventually dawned upon the Post Office at, or about the time of, the introduction of the NTC... However, there is no reliable evidence to suggest that this was done in the days prior to the use of the NTC. Mr Haworth may have persuaded himself that he did – and I am not finding that he consciously sought to mislead me – but there is no corroboration of this... Mr Haworth’s evidence that he did tell an interviewee to seek legal advice is, in my judgment, simply wishful thinking on both his, and the Post Office’s part, and I find that this did not occur. 507. Mr Carpenter said he had noticed his witness statement was wrong so far as the location was concerned, but he had not asked to correct it. This was not a promising start to a witness giving accurate evidence. However, on the basis that he could not remember the interview at all, it may not much matter that he could not even remember where it had taken place. 515.4 An investigation would only be started – even on Mr Carpenter’s evidence – if after an invoice had been sent (which did not refer to contractual obligations for losses, and asserted sums due to the Post Office in blanket terms) an SPM did not pay it and said “I can’t make it good, I have a problem”. I have seen no correspondence to any SPM that explains this, and this ability does not seem to have been notified to any SPM. It is also directly contrary to the correspondence sent to the SPM telling them to pay the sum due. No such option is explained in that correspondence. 516. I have already identified, when considering Mrs Stockdale’s evidence, that these proceedings contain very wide ranging and extremely serious allegations against the Post Office. They include allegations of unlawful treatment, including that the Post Office has prosecuted Claimants, leading to bankruptcy and community and custodial sentences (which means imprisonment). Shortly after proceedings were issued, the Post Office acted as it did with Mrs Stockdale, shutting her branch and stating she was considered to have committed a criminal offence. It also expressly stated to her factually untrue statements, namely that she had not contacted the NSBC or asked the Post Office for assistance. I find that she had. 517. It must be understood with crystal clarity that I am not making findings on these substantive and serious issues in this judgment. 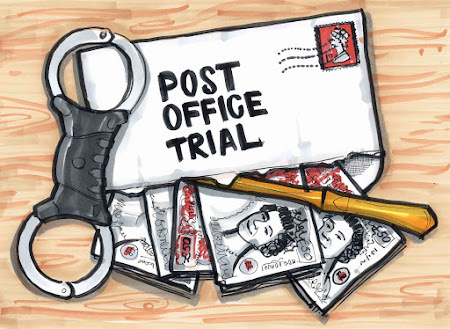 Whether the Post Office was guilty of acting in the ways complained of by the Claimants can only be resolved later in these proceedings after other trials. However, even putting it at its best for the Post Office, such conduct towards Mrs Stockdale during this early stage of the litigation could potentially be construed as threatening, oppressive, and potentially discouraging to other potential Claimants to become involved in the litigation, whether by accident or design. I can think of no reason why such an approach was taken unilaterally by the Post Office in such a way, without the Post Office’s solicitors giving advance notice to her solicitors, so that a less confrontational and aggressive path was adopted, given her role as a claimant in the litigation. However, even once it was done and she was suspended, the Post Office continued to act in a highly regrettable fashion. 518. Further, the discourtesy in the Post Office simply ignoring so many communications from the SPM herself to them is extremely puzzling. The Post Office wrote to her directly (rather than to the Claimants’ solicitors on her behalf) when it suited them; her requests back in response were not even given a bare acknowledgement, or a request that she communicate to the Post Office’s solicitors. Even her most basic and immediate request to be provided with details of the appeal process was simply ignored. Even Mr Carpenter accepted that, if he had not known she was a claimant (which he was not sure about) he had found out extremely quickly. Yet here the Post Office was, simply ignoring and “stonewalling” the desperate attempts to communicate back to them from Mrs Stockdale. I do not understand why direct communications were made to her given she had solicitors on the record acting for her. However, if direct communications were to adopted, that should have been two- way, and there is no reason to send letters directly but entirely ignore everything that came back in return. 519. I am troubled by the way that the Post Office has acted in relation to Mrs Stockdale since April 2016. 520. That concern is amplified by the approach of the Post Office to specific disclosure requests made by the Claimants’ solicitors in this litigation in the period following the audit. On 26 May 2016 Freeths asked for disclosure of different categories of documents relating to Mrs Stockdale. These were precisely drafted categories, and included (for example) Helpline printouts, audit reports, and internal Post Office correspondence including that relating to the basis for, and making of, the decision to audit her branch and suspend her. The answer to that from the Post Office’s solicitors Womble Bond Dickinson was in a letter dated 2 June 2016 and said “in circumstances where you have not set out any basis on which you believe that our client’s actions have been unlawful or otherwise affect Mrs Stockdale’s ability to participate in the Bates High Court litigation, we are not currently minded to engage in ad hoc piecemeal disclosure connected to a live investigation.” All that the Post Office was prepared to do was preserve the documentation, which it should be noted, it would be required to do as a bare minimum to comply with a litigant’s obligations of disclosure generally. I am surprised that it even occurred to the Post Office otherwise that it might not preserve such documents. Offering to preserve potentially important documents in High Court litigation, rather than destroy them, is not a concession. 523. For the reasons I have expressed above, I have considerable misgivings about the Post Office’s motivation for the treatment of Mrs Stockdale during this litigation, and for the treatment itself in terms of refusal to provide obviously relevant documents. The evidence by Mr Carpenter, far from satisfying these concerns, actually increases them. The Post Office appears, at least at times, to conduct itself as though it is answerable only to itself. The statement that it is prepared to preserve documents – as though that were a concession – and the obdurate to accept the relevance of plainly important documents, and to refuse to produce them, is extremely worrying. This would be a worrying position were it to be adopted by any litigant; the Post Office is an organisation responsible for providing a public service, which in my judgment makes it even worse. 530. his written evidence in chief was not only so general, but so inaccurate. 532. it appeared as though his witness statement had been written by someone else, and not by Mr Trotter. 533. I have already stated above, when reviewing Mrs Dar’s evidence, that I do not accept that Mr Trotter specifically told her she did not need to obtain legal advice. 534. Mr Trotter was accused of being evasive in some of his answers. I do not accept that he was being evasive, but he certainly seemed extremely nervous about giving evidence before me that he thought might be unhelpful to the Post Office. 535. When a particular claimant states that they never received the SPMC, and all that the Post Office can do is to produce a witness who basically says “well, it should have been in the envelope” and that claimant is accepted by the court as being reliable and broadly accurate, it does not require the application of advanced theoretical physics to conclude that the SPMC was probably not, on that occasion, sent to that claimant. 538. The confusing and contradictory nature of the documents produced by the Post Office to SPMs, and the difference in terminology when referring to a particular document, together with the same terminology to refer to different documents, does not assist the Post Office in its factual case against the different Lead Claimants in this trial. 539. The approach of the Post Office can be summarised as follows: the outgoing SPM would have had his or her contract available; you would, should and probably did ask to see it; if you had, it would (or might) have been shown to you; therefore you had knowledge of the terms, and contracted with the Post Office on that basis. The weaknesses in such an approach are in my judgment obvious, and numerous.